Italian Ice – Little Jimmy’s Italian Ices Is A Big Biz Hit! 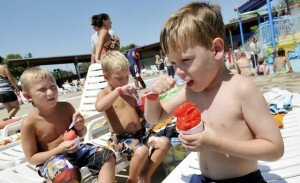 Little Jimmy’s Italian Ices Is A Big Biz Hit! “There is an actual letter from a customer, Ed and Karen Hensas in Idaho Falls, Idaho. After two years selling Little Jimmy’s Italian Ices, they came out to New Jersey to meet us and tour the factory,” said Mr. Maglione. 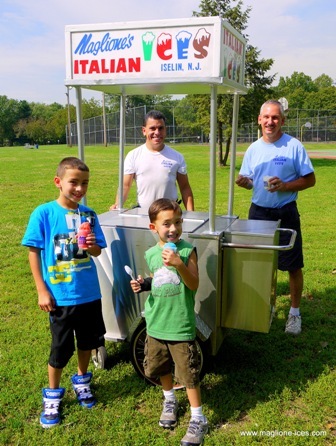 “We originally saw Little Jimmy’s Italian Ices in 2010 in Small Business Opportunities Magazine. We made some calls and did the ‘homework’ for starting the business, but due to other circumstances let the opportunity pass. We both had our regular jobs and continued on. In June of 2013, we were both working for the same company and both lost our jobs at the same time. They way that our jobs were eliminated did not even allow us to collect unemployment. “Ed had a life insurance policy that we decided to cash in, in order to buy our Little Jimmy’s Italian Ice cart. Since we were a long way from the east coast where Italian Ice is very well known, we ordered a single 3-gallon can of Lemon Ice. First, we wanted to sample it to see that it was authentic and second to try it out at a couple large community gatherings. IT WAS A HIT! “We sent our money in to place our initial order and received our cart and supplies within a week, and the ice came a few days later. This business has become so successful that it allowed us to pay our bills and keep ourselves going without a regular 9-5 job. It is a seasonal business because of the cold weather and lack of events in our area. We are however booked into a big Christmas Expo which will be held indoors. “This business has allowed us to keep the household running and help our children when needed. We are looking to get another Little Jimmy’s cart and are even expanding into other types of food that we can sell all year long. This fact is ironic as my husband had mentioned several times (even years ago back in NJ) that we should start some type of food business and I always said no because of too many regulations and health codes. It seems that Italian Ice is pretty much exempt from a lot of the strict health codes in many areas, so it’s the best of both worlds,” said Ed. Please check the website at italianice.net for additional information about business opportunities and for more info on Little Jimmy’s products. This is real Italian Ice, “imported from New Jersey”. Register on the website to get the company’s business package prices and more information about all the money you can make retailing Italian Ices. 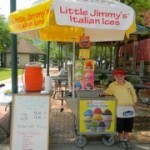 We originally saw Little Jimmy’s Italian Ices in 2010 in Small Business Opportunities Magazine. We made some calls and did the ‘homework’ for starting the business, but due to other circumstances let the opportunity pass. We both had our regular jobs and continued on. In June of 2013, we were both working for the same company and both lost our jobs at the same time. They way that our jobs were eliminated did not even allow us to collect unemployment. Ed had a life insurance policy that we decided to cash in, in order to buy our Little Jimmy’s Italian Ice cart. Since we were a long way from the east coast where Italian Ice is very well known, we ordered a single 3-gallon can of Lemon Ice. First, we wanted to sample it to see that it was authentic and second to try it out at a couple large community gatherings. IT WAS A HIT! We sent our money in to place our initial order and received our cart and supplies within a week, and the ice came a few days later. This business has become so successful that it allowed us to pay our bills and keep ourselves going without a regular 9-5 job. It is a seasonal business because of the cold weather and lack of events in our area. We are however booked into a big Christmas Expo which will be held indoors. This business has allowed us to keep the household running and help our children when needed. We are looking to get another Little Jimmy’s cart and are even expanding into other types of food that we can sell all year long. This fact is ironic as my husband had mentioned several times (even years ago back in NJ) that we should start some type of food business and I always said no because of too many regulations and health codes. It seems that Italian Ice is pretty much exempt from a lot of the strict health codes in many areas, so it’s the best of both worlds, said Ed. To wrap it up we were the show stopper as we beat the competition. What flavor can I add rum to and how should it be done? look forward to our continued business relationship. Popular in any region, you can start your own business selling Italian ice from a cute pushcart for less than $4300. with help from Little Jimmy’s Italian Ices & Push Carts company. The carts are colorful and fun and fit in most minivans or SUV’s. And the carts require no electricity or dry ice so you can sell your products anywhere. Italian Ice is a dessert treat that has been around for centuries. Little Jimmy’s Italian Ice recipe consists of a water-based, fat-free, dairy-free, cholesterol-free, and high fructose corn syrup-free gourmet dessert of many different flavors. Little Jimmy’s Italian Ice is a true Italian water ice that has the creaminess of sherbet or ice cream and never contains any dairy or non-dairy creamer. Their Italian ice is produced the old fashioned way in Elizabeth, New Jersey. Little Jimmy’s Italian water Ice is sold at malls, stadiums, amusement parks, festivals, fairs, beaches, flea markets, camps, state parks, swim clubs, golf courses, resort hotels, carnivals, zoos, etc. At these locations our water ice is sold from Italian ice push carts, concession trailers, kiosks, freezers and concession stands. 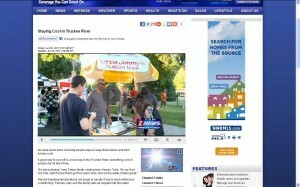 In fact, anywhere there is a gathering or flow of people, there is an opportunity to sell Little Jimmy’s Italian Ice. There is no experience required to start this business and you can get going right now in time for the super hot summer season. 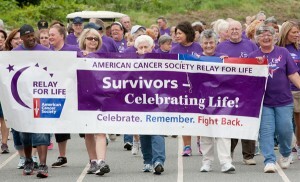 For more information on how you can get started visit www.ITALIANICE.net or call the company at 800/763-4348 FREE. Little Jimmy’s Italian Ices is proudly owned by Maglione’s Italian Ice based in Iselin, NJ, since January 17, 2014. Maglione’s Italian Ice was founded by Ralph Maglione Sr. and his wife, Flo, in 1957. They raised the entire family to be a part of the business from their Iselin home–where the business still is headquartered today! And now, the grandkids are celebrating their Italian heritage and learning how to make the delicious, old school, frozen treats! Read more about the Maglione family and the business by visiting maglione-ices.com. 9 Year old Businessman Jack of Jack Frost Italian Ices stopped by the Little Jimmy’s headquarters in Elizabeth, NJ with his dad and uncle today. The Barretts decided to purchase a Little Jimmy’s pushcart cart because of its low overhead and to fill a need left open this summer with the fate of nearby D and R Ice Cream in question after the flood, Barrett said. The Athens borough council granted the Barretts permission to serve the frozen treats in the square last week. All week we’ve been showing people ways to keep themselves and their homes cool. A good way to cool off is a nice hop in the Truckee River, something a lot of people did all day Friday. Record-breaking temperatures are tough to handle if you’re stuck without air conditioning. Parents, kids and the family pets all hopped into the water. The Truckee River may be chilly, but folks say it feels pretty refreshing with the sun beating down. “It’s icy cold, but when you get out, you feel much better and it’s very relaxing, and it’s nice to be out here with all the kids and it’s a beautiful place,” says Chandra Peckham. With temperatures set to hit triple digits this weekend, you can expect Wingfield Park to be packed on Saturday and Sunday. Festival held here in Reno annually. Their 4th, our 1st. of water and they sold out by 2 pm. one kite in the air. Love Little Jimmy’s Italian Ices. Hi Dennis, I just want to let you know how our first adventure in the Italian Ices business went. 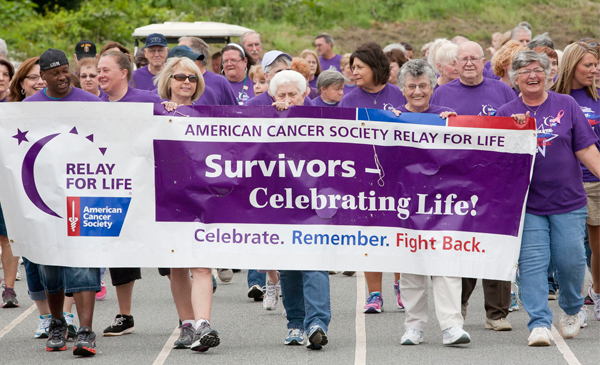 Well, we were asked to shown up at a Relay for Life event in Lincolnton, NC on a Friday afternoon. The event started at 6p.m. with the expectation of the vendors setting up no later than 5p.m. Since this was our first event, we took more than we thought we would need (cups, spoons, napkins, Ice etc.). The setup went very smooth even though I was very nervous. I had purchased the ice cream bag Anthony displayed in his video and let me tell you, that thing kept my extra cans of ice cold and in excellent state all evening. People loved the fact that I wore gloves and cleaned my flat surfaces constantly. They loved the free samples even more. The night was a constant scooping extravaganza. The lines were not terribly long, but they sure were steady (I actually scoop a blister onto my index finger). We did very well (almost breaking $1000) for the five hours we scooped even though there was a “soft ice cream” vendor three sections down. Everyone raved about the smooth texture and sweet flavor of the ice. The flavor was just right…not too sweet or overpowering. We were asked to come back next year. We have a boat show to do this Saturday (saw them setting up the signage and dropped off a card) that will include four live bands, and various recreations. We also have a huge 2-day festival to do the week after. I just want to say that I am thrilled to be a part of Little Jimmy’s Italian Ices. Thank you for a great product! Summer Job Suggestion: Recently one of our customers from Indiana was interviewed by the Chronicle Tribune in Indiana. They also shot this great video of Bob poolside serving his customers while being interviewed by a reporter there. Great idea for summer jobs for teachers and students this summer. What were you thinking of doing this summer? Why not a Little Jimmy’s Italian Ice pushcart to set up at pools and high traffic areas. Tremendous summer job idea- great jobs tor teachers in the summer and students seeking work or for a summer job for teachers over the summer.